I’m sure people look at me like “this guy doesn’t know what he’s talking about.” I know I have on several different occasions reported on a potential release date, but I’m just passing the message on. So with that being said, I reported a few days ago of a promising screenshot of an internal Sprint employee popped up saying that Android 2.1 update for the Samsung Moment and HTC Hero would be here the first week of May. So far Samsung Moment users have yet to see any update, which was supposed to come on the last day of April. 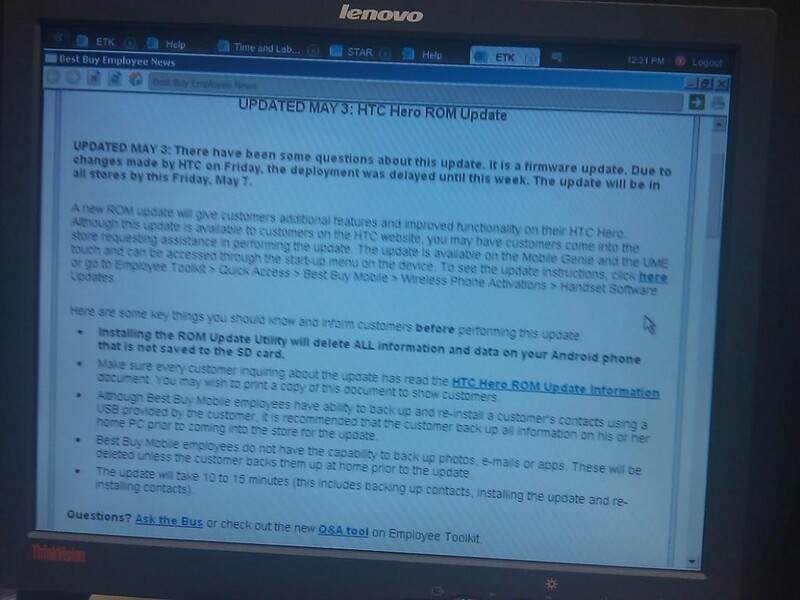 Now a newer, more recent screenshot has appeared this time from a Best Buy computer, and according to this latest information, the Sprint Hero update will be rolled out to all stores with technicians and service centers this Friday May 7th along with availability on HTC’s support site. Apparently some last minute changes made by HTC on friday, have caused the update to be pushed back just bit. It’s hard to tell what is going internally at HTC and Sprint thats causing all the delays, but this is what we have to go on now, it doesn’t confirm the date 100%, but it’s what employees are being told. We will see what happens on May 7th. No word on when the Samsung Moment will be getting the update, I would guess it’s on schedule to come any day now, but nobody knows for sure. Just a reminder this update will require a full wipe of all internal data, so make sure you back everything up. The very last post in the thread. Please kill the rumor mill.